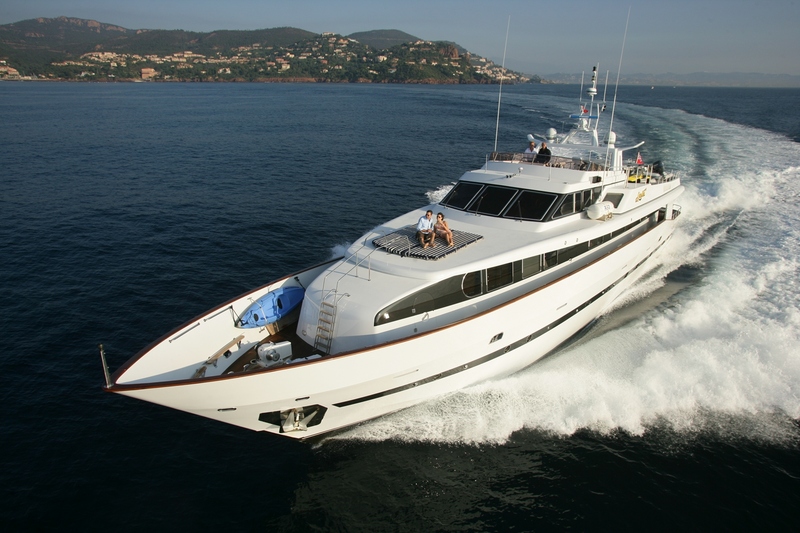 Motor yacht Avella is a 33,5m (110ft) Azimut built yacht launched in 1991, and refitted in 2013, designed for luxury and comfort both for cruising in the Western Mediterranean and for quayside charters. 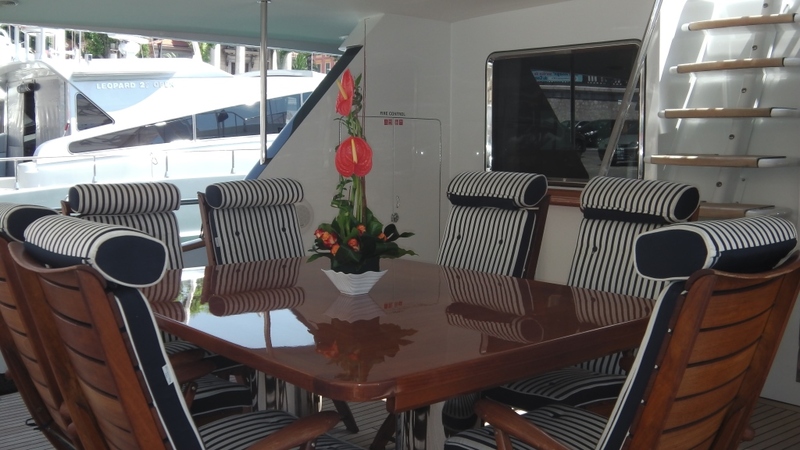 There is a spacious Aft deck with a teak table and seating for 8, steps up to a vast Fly bridge and a fabulous sun deck with an electronic sunshade and a further outdoor dining area with a BBQ and fridge. 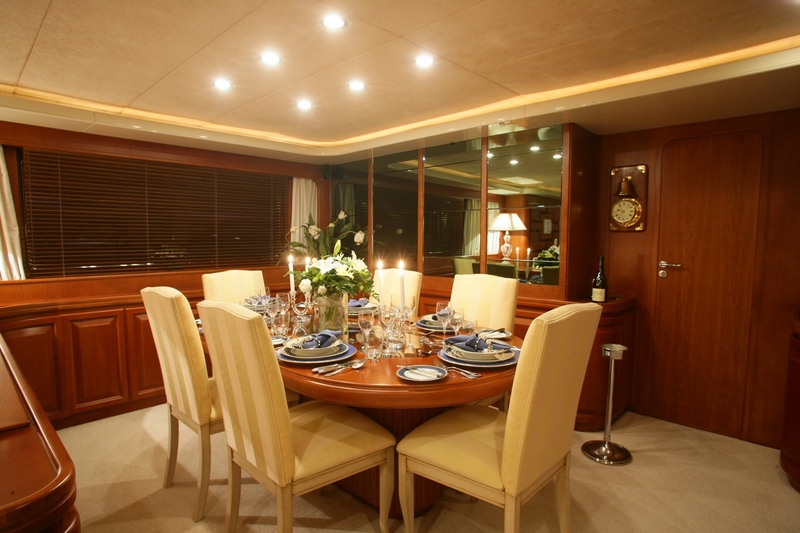 Use of the outside space has been maximised for guests on board charter yacht Avella to capture the Mediterranean sunshine, both forward and Aft for sunbathing and entertaining, whether a private dinner, party or quayside event. 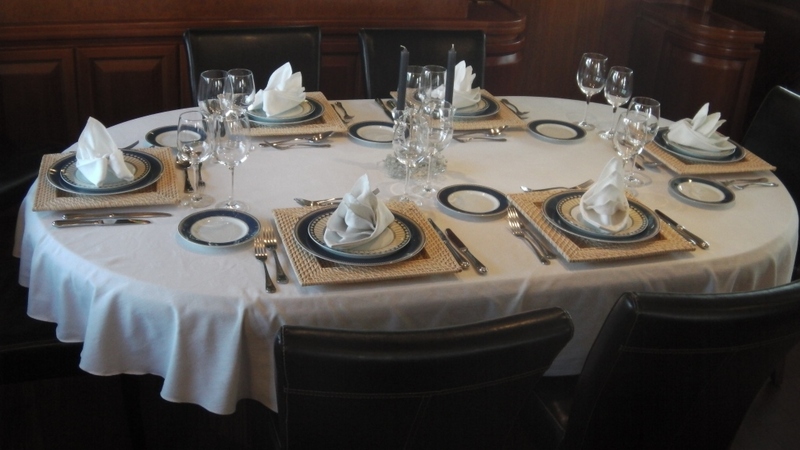 With family or with friends chartering Azimut motor yacht Avella provides the opportunity to enjoy a magic moment onboard a luxury yacht- the Captain and his crew accommodating your every need and guiding you with the wonderful choices you can make during your stay onboard. 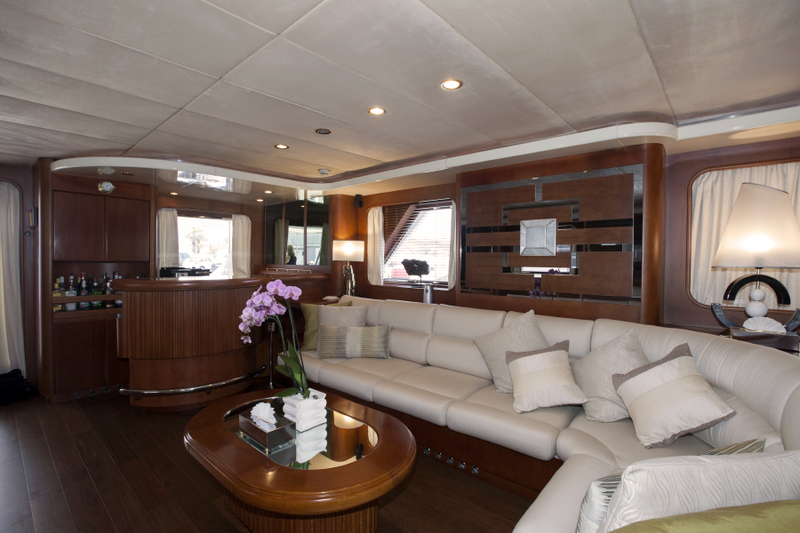 M/Y Avella’s salon is an excellent size with a mid oak and cream colour scheme – it’s sofas easily seat 12 people and there is an Additional bar area with seats as you enter. Partially dividing this room along one edge of the sofa is a retractable flat screen 1 metre TV. 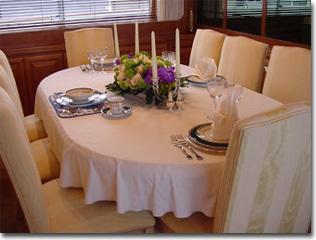 This leads through to the dining area, which is wood panelled and features a large dining table with leather chairs for 8 people, altogether a fantastic are to hold a formal dinner party. 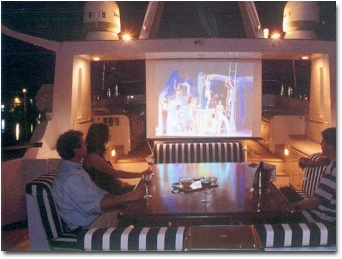 All rooms are fitted with large flat screen TV and sound systems – there is surround sound in the Salon and upper deck where there is also a portable outdoor cinema screen. 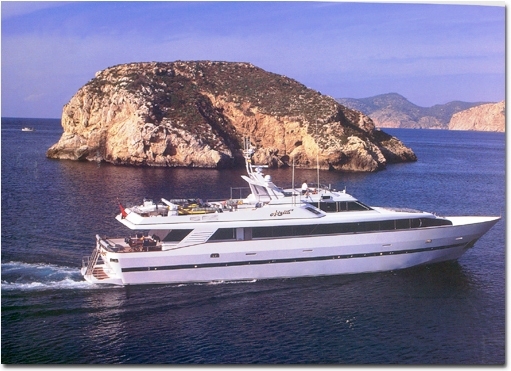 French based, motor yacht Avella, is a commercial vessel, and is fully equipped for charters. 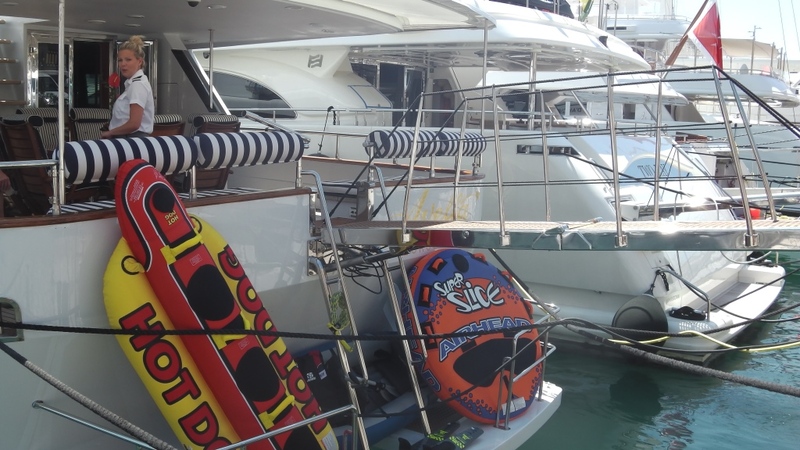 The ample swimming platform is accessed by a generous central staircase, and from there it is just a step onto the yachts tender, a powerful Zodiac Yachtline 470 RIB -needless to say all the equipment for water skiing and other toys are at hand. 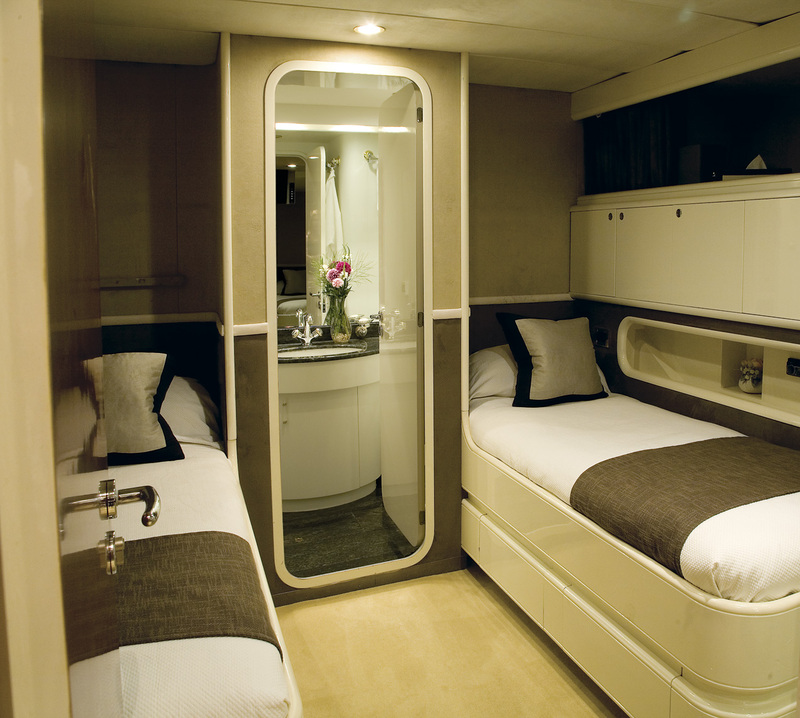 MY Avella exudes comfort throughout, spaciousness and classic elegance. 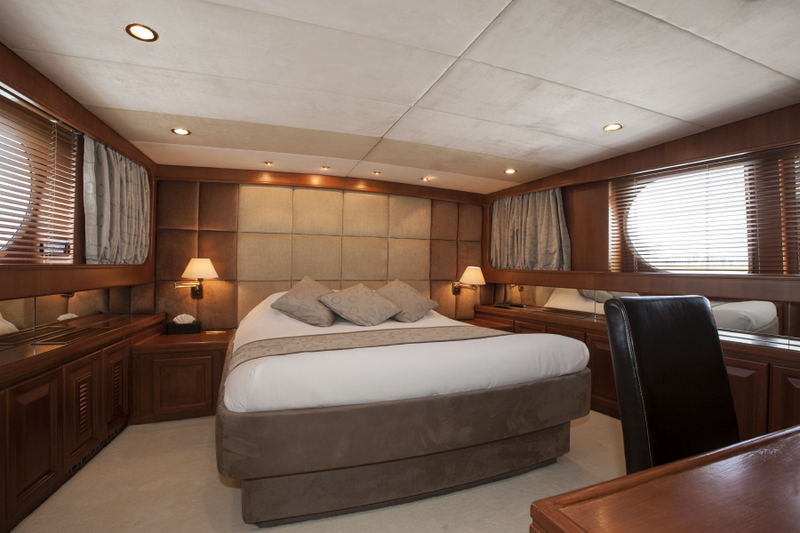 The AVELLA motor yacht received a refit in 2013 which included a repaint of the hull, interior oak floors, carpeting in bedrooms as well as new upholstery. 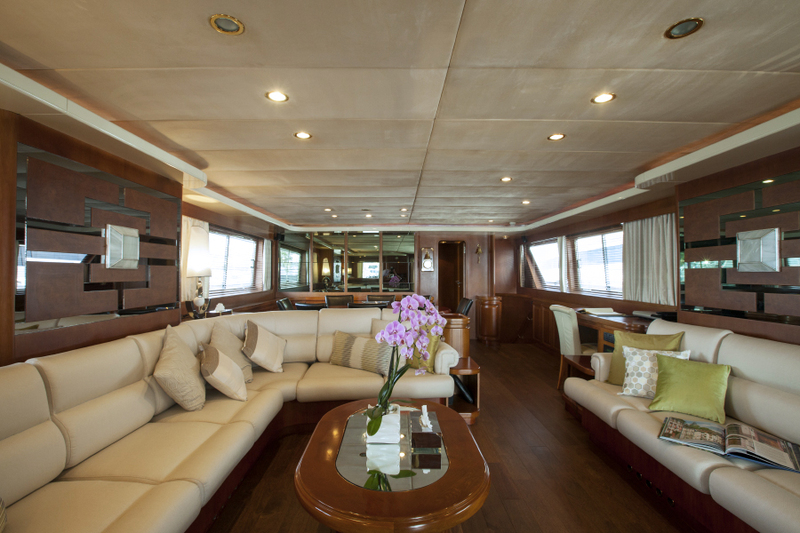 Azimut Motor yacht Avella can easily accommodate 8-10 guests in her 4 luxurious cabins. 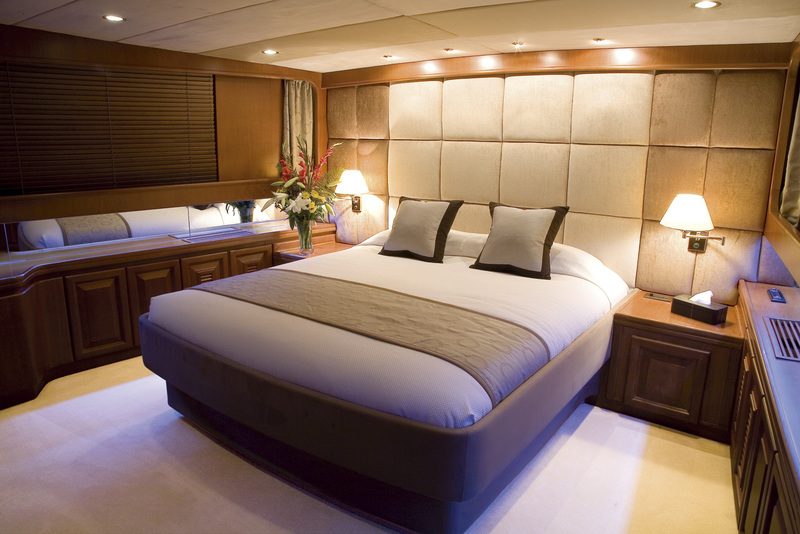 The Master Stateroom is on the deck level extending full width of the yacht and offers extreme comfort with relaxing oak wood and cream furnishing, its own luxury bathroom with shower and twin sinks. 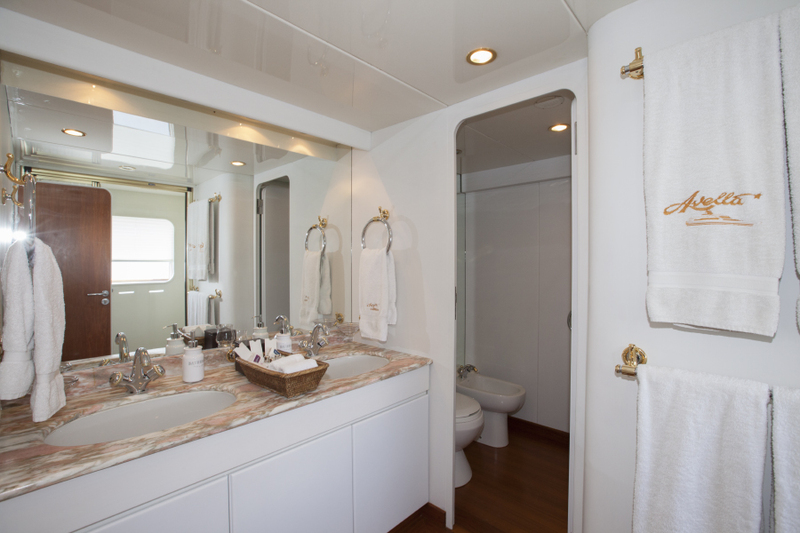 The VIP is another treasure with its own generous bath and double sinks – again the light coloured fabrics ensure a relaxing stay. 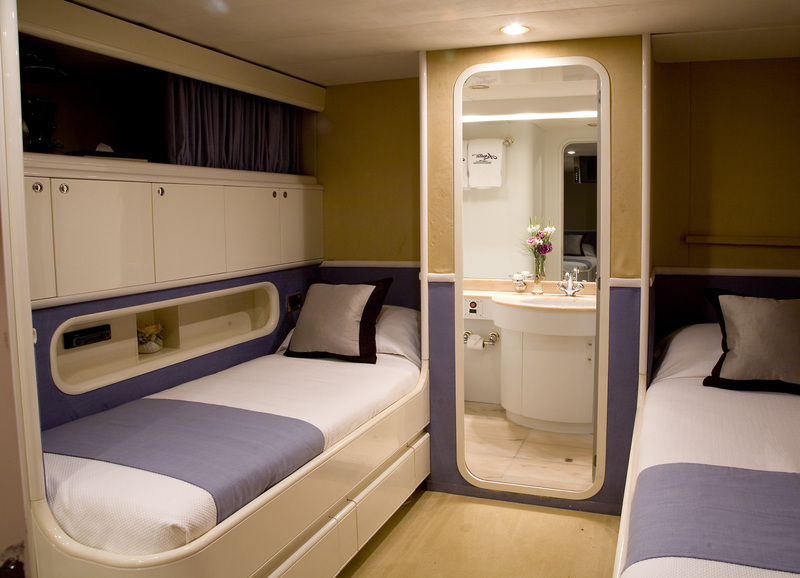 Two twin roomed en suite cabins, with an additional Pullman bed each are beyond the VIP room. 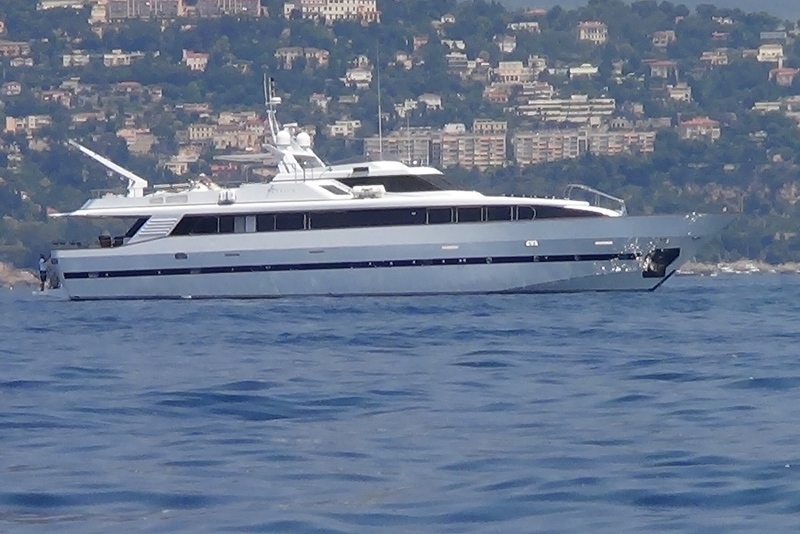 Motor yacht Avella has the following Charter Amenities and Extras: A Zodiac Yachtline 470 RIB, a double and single donut, a triple banana, 2 Yamaha VX Cruiser Waverunners, a double sea Kayaks, Water Skis, Flippers, masks & snorkels – Quicksilver Wakeboard. Scuba Diving can be arranged on request. RYA Jet ski training offered onboard. 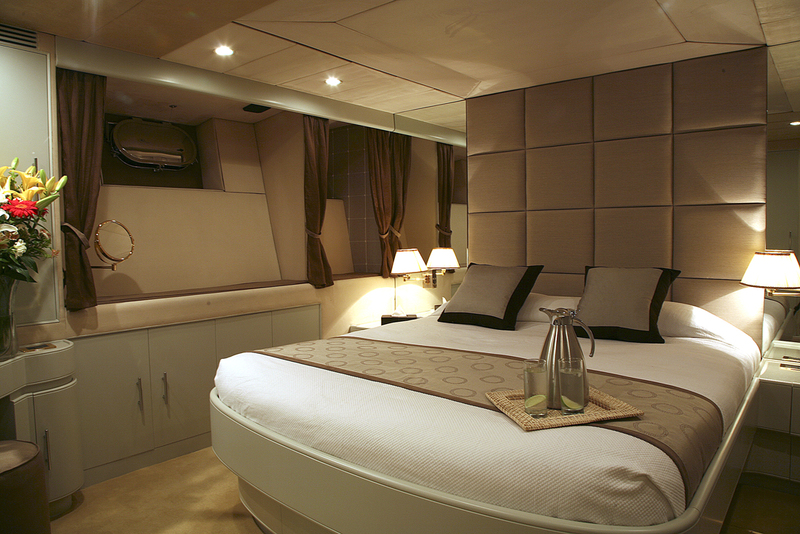 Bose surround sound salon/sundeck, Audio, All rooms are fitted with large flat screen SKY TV and sound systems – there is surround sound in the Salon and upper deck where there is also a portable outdoor cinema screen.